Former Health Secretary Andy Burnham vows to make Labour the "people's party" as he announces plans to join the leadership battle. Mr Burnham's candidacy follows veteran Labour left-winger Diane Abbott, who threw her hat into the ring this morning. 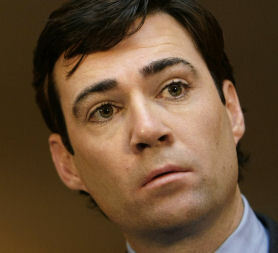 Mr Burnham declared his intentions this afternoon with a brief speech in Manchester. He said: "It's a big step but one I'm ready to make. The party is my life, and Labour is my passion. It hurts me when we lose. "The theme for my campaign will be simple, reconnecting Labour with its grass roots. I want it always to be the case that young people will look first to the Labour party if they want to change the world. "The country needs a strong Labour party and it's my intention is to help us rebuild it as the people's party." Mr Burnham will stand against Diane Abbott - who became a surprise entry this morning - as well as former schools secretary Ed Balls, brothers David and Ed Miliband and left-winger John McDonnell. Labour has caved in to complaints from the candidates by allowing them an extra 13 days to gather nominations - the closing date will now be 9 June. Announcing his bid Mr Burnham said: "It's shaping up to be a very wide contest and that's a good thing for Labour – it needs a vibrant discussion. "I think I have got a strong case to make and I will make it with confidence. We are different people from different backgrounds, with different perspectives." He added that after defeat in the General Election, Labour needed to hear some "home truths". Earlier in the day Diane Abbott announced she would run for the Labour leadership. Writing in the Guardian newspaper she said: "Ever since it became clear that a Labour leadership race was in the offing, people have been urging me to run. "The declared frontrunners are hugely talented, but the danger is that they are 'hoovering up' all the nominations and sucking the air out of the contest. "This is pivotal moment for the party, and there is a long summer of hustings ahead. And many people believe that we need the broadest range of candidates in the race. "Otherwise, many issues that Labour party members (and the public) want to debate will be off the table. An urgent question is how we revive the Labour party and "reboot" party democracy." Meanwhile. it has been confirmed Lord Mandelson and Lord Adonis have stepped down from the shadow cabinet to allow their roles to be taken by Labour MPs.